For Autumn/Winter 2013, Musto are proving their Shooting collection is one of the best around, and nothing proves this more-so than the new Fenland Jacket. The Fenland lends itself well to the traditional shooting community by looking like a shooting jacket rather than an anorak, which would be chastised on shooting days! Musto has developed a fabric that is a bit different; yes it is very lightweight, durable, waterproof, breathable, but more importantly it looks the part. The new Fenland Packaway has the look of a traditional shooting jacket, but is so light you won’t find it a drag to wear all day, and it won’t restrict your movement when swinging the gun. Weighing just 0.6 kg the Fenland packs down into its own internal pocket which is great for days when the weather may turn, or just to be kept handy in the car for those unexpected downpours! One of the best features of this jacket is that it has a hydrostatic water head (HH) of 10,000mm, giving you confidence you will stay dry even in really heavy rain. The HH measurement is used to determine how much water pressure a material can withstand, and if you’ve seen it before it is also used as a guide when buying a tent. 10,000mm HH is an incredible amount for this type of garment (infact it’s over 3 times the industry standard! ), and with a Musto quality finish, you can be assured that it will keep you dry in even the worst weather. The light Nylon outer has a hydrophilic breathable, waterproof and windproof coating keeping you fully protected when you need it, as well as an adjustable drawcord waist and hem, allowing you to keep warm air in on colder days. It’s machine washable (always follow the instructions sewn into the jacket) and after a lot of washing and quite a few years it may need reproofing to keep the water out. There are several good products available such as Nikwax and Grangers, however you shouldn’t need to worry about this for some time. One of the best features is that it’s made from a rip stop fabric meaning that even if you do catch it on something really sharp, the damage should be limited. 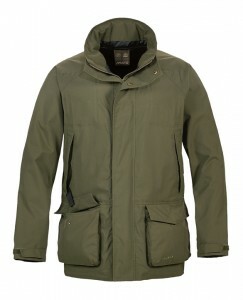 Musto jackets often last well over a decade so you can rest assured that you have a quality product when buying Musto. For shooters there is a pocket to add a D30® recoil pad, easy to access cartridge pockets and the always essential handwarmer pockets. Articulated sleeves are par for the course in shooting jackets to allow ease of movement, while Velcro adjustable cuffs allow for comfort; there is also a removable hood, and a two-way zip for when you need it. All in all this is an incredibly high performance and top quality jacket which Musto has added to their range, and we’re certain the Fenland will be one of the key pieces of the season. D30, D30 Recoil Pad, Fenland, Musto, Musto Fenland, Musto Shooting, Musto Shooting Jacket, Shooting Jacket. Bookmark.